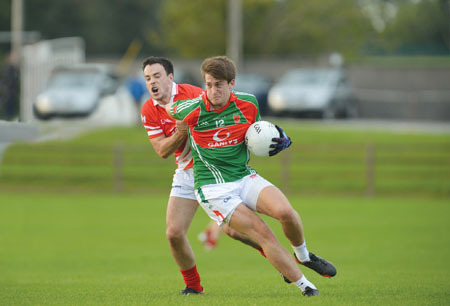 The first of the quarter-finals in this year’s Westmeath senior football championship saw Tyrrellspass prove too strong for an Athlone side that were far too slow out of the blocks in Moate last Sunday evening. Driven on by the talented Ger Egan from his centre-half back berth, Tom Coffey’s men enjoyed a nine-point lead after just 10 minutes of play. Athlone had managed a Lazarus-like recovery in the final quarter the previous week against Bunbrosna but against a more balanced Tyrrellspass side overhauling such a deficit was always going to be a tall order. With that said the second half saw an improved showing from The Town side and had Paul Bannon’s penalty effort been converted midway through the half the gap would have been down to four and it would have made for an exciting final quarter. Instead Darren Quinn saved well and any hopes Athlone had of progressing to a semi-final were all but gone. We did manage to close the gap to five points but a deflected own goal proved the final nail in our coffin as Tyrrellspass ran out comfortable winners. They now advance to meet Mullingar Shamrocks in the semi-final and on this form they will be well capable of putting it up to the reigning champions. From an Athlone point of view making the knockout stages is a step in the right direction. Six or seven teenagers made their senior championship debuts this year and will have learned a lot in a short space of time. Consistency has been our biggest problem and if we are to be in with a chance of winning championships in the coming years will have to work on that. Garrycastle were pushed all the way by a battling Castledaly side in the play-off to see who will face The Downs in the second quarter-final. In the end Michael McDermott’s side ran out worthy 1-15 to 1-11 winners, the goal coming from the boot of Matthew Guiheen. They remain in the hunt and while they may not appear as invincible as in previous years it would be foolish to write them off completely. Their clash with The Downs takes place in Moate on Saturday September 14 where I expect them to book their semi-final ticket. Meanwhile Killucan left nothing to chance with a convincing 2-10 to 0-8 win over a limited C/F/C/W in the relegation play-off. Paul Greville and James Nugent bagged the goals for the winners who will be hoping not to find themselves staring at the trap door for the third year running next year. C/F/C/W’s return to intermediate ranks is not surprising given the number of players they have lost to emigration.